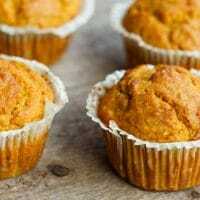 These Muffins are packed full of anti-inflammatory ingredients such as sweet potato, coconut, turmeric, ginger, and cinnamon. These also taste absolutely delicious! Poke your sweet potato skin with a fork, then cook it on a pan for 1 hour or until soft. You can also cook in the microwave to save some time. Allow potato to cool, and then cut it in half and scoop out the insides into a large bowl. Add the egg, coconut milk, olive oil, and maple syrup. Combine until smooth. In a separate bowl, mix all of the dry ingredients, then add these to the sweet potato mixture and stir until fully combined. Grease your muffin pan, then pour the batter evenly into the pan so that each one is approximately 2/3 full.